Apple's fancy new voice assistant for the iPhone 4S, Siri, went down Wednesday morning and didn't come back up until the evening--and even then, only for some users. iPhone 4S users across the country discovered that Siri was no longer able to connect to the network--even though they had 3G or Wi-Fi connections--starting around 11 a.m. PDT Wednesday. According to Venture Beat, contacting Apple customer service resulted in the typical, "Have you tried restarting your device?" When restarting devices did not fix the problem, Apple suggested that it was "entirely possible" that there was a network outage. Note that Apple, as usual, was careful to avoid admitting there was a problem. Some users started reporting Siri back online around 4 p.m. PDT, but not everyone. When I dropped by the Apple store in Westfield Valley Fair in Silicon Valley, none of the iPhone 4S's was able to connect to the network. To Siri's credit, I did at least get a variety of "unable to connect to the network" responses, including "Sorry, I'm having trouble connecting to the network," and "Sorry, I don't have a network connection." 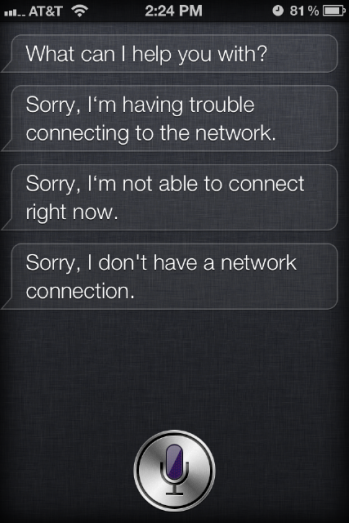 So…for what it's worth, at least we know Siri maintains her "personality," even when the network's down. The good news is that users are now reporting that Siri is back to normal. The bad news is that Apple is yet to make an official statement about the outage. Though Siri is built into the iPhone 4S, it is not really voice recognition technology so much as an advanced search engine. So while Siri is capable of interacting with a few apps sans a data connection (for example, basic voice recognition tasks on your phone), it does need to be able to connect to the network in order to answer users' questions, such as "What's the weather like in Toronto," "How many teaspoons are in a cup," and "Where can I bury this body?" UPDATE [1:15 p.m.]: A reader reports that even basic Siri tasks, such as voice-to-text, are unavailable when the network is down. That just makes the whole situation even worse.